Eric Sorkin, co-founder of Runamok Maple, speaks at the grant ceremony. Also on stage are Christine Frost, program director, Northern Border Regional Commission; Laura Sorkin, Runamok co-founder; Brad Docheff, Fairfax town manager; Vermont Gov. Phil Scott; and U.S. Sen. Patrick Leahy. 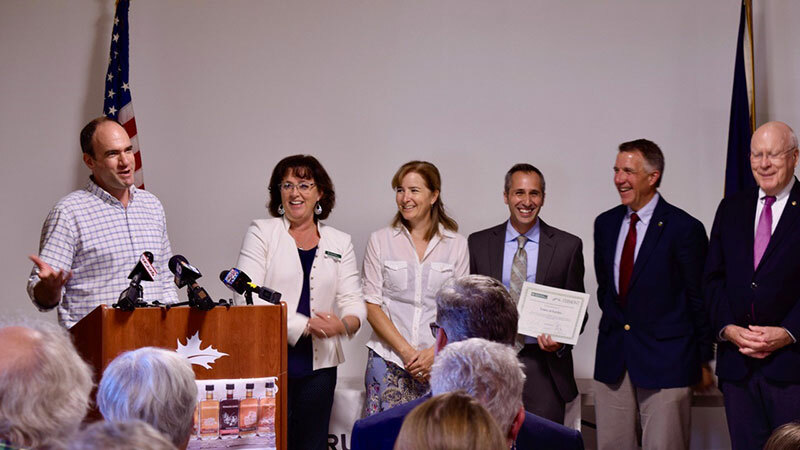 Runamok Maple is one of the 14 northern Vermont organizations that will benefit from $2.8 million in federal grants from the Northern Border Regional Commission. The grant will allow Runamok Maple to expand, giving the company the opportunity to hire more than 50 new employees. Runamok Maple recently relocated to a new facility at 293 Fletcher Road in Fairfax, Vermont. On Aug. 10, Vermont Gov. 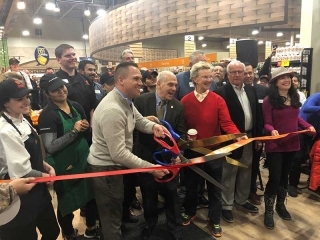 Phil Scott and U.S. Sen. Patrick Leahy joined company co-founders Eric and Laura Sorkin at their new facility in Fairfax. The Fletcher Road building where Runamok Maple has moved its operations has a rich history, as it once was the building where thousands of Scrabble board game tiles were made. The facility, which is more than 50,000 s.f., will provide the company with more space to expand its business and will bring new jobs to the local community. Runamok Maple is a manufacturer of all-natural, organic maple syrup that is produced from maple trees located along the northwest slopes of Vermont’s Mount Mansfield. 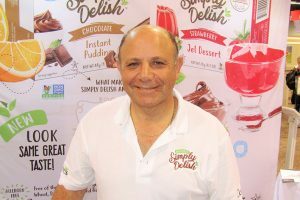 Over the last year, Runamok Maple has experienced significant growth, not only through its growing maple syrup portfolio but also through the acquisition of Bascom Maple Farms’ candy and cream business, which was acquired in December 2016. 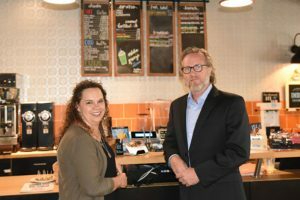 Connecticut Private Equity Firm Acquires Rise Baking Co.